Astrocytes are specialized glial cells that outnumber neurons by over fivefold. They contiguously tile the entire central nervous system (CNS) and exert many essential complex functions in the healthy CNS. Astrocytes respond to all forms of CNS insults through a process referred to as reactive astrogliosis, which has become a pathological hallmark of CNS structural lesions. Substantial progress has been made recently in determining functions and mechanisms of reactive astrogliosis and in identifying roles of astrocytes in CNS disorders and pathologies. A vast molecular arsenal at the disposal of reactive astrocytes is being defined. Transgenic mouse models are dissecting specific aspects of reactive astrocytosis and glial scar formation in vivo. Astrocyte involvement in specific clinicopathological entities is being defined. It is now clear that reactive astrogliosis is not a simple all-or-none phenomenon but is a finely gradated continuum of changes that occur in context-dependent manners regulated by specific signaling events. These changes range from reversible alterations in gene expression and cell hypertrophy with preservation of cellular domains and tissue structure, to long-lasting scar formation with rearrangement of tissue structure. Increasing evidence points towards the potential of reactive astrogliosis to play either primary or contributing roles in CNS disorders via loss of normal astrocyte functions or gain of abnormal effects. This article reviews (1) astrocyte functions in healthy CNS, (2) mechanisms and functions of reactive astrogliosis and glial scar formation, and (3) ways in which reactive astrocytes may cause or contribute to specific CNS disorders and lesions. Until quite recently, the prevailing view regarding the biology and pathology of astrocytes among those studying clinical disorders and structural lesions of the central nervous system (CNS) was most likely to be that (1) astrocytes are supportive glial cell components in neural tissue and (2) reactive astrogliosis is a reliable and sensitive marker of diseased tissue. The notion that dysfunctions of astrocytes or reactive astrocytes might contribute to the presentation of clinical signs or to mechanisms leading to pathological changes in CNS tissue was generally not considered. However, this viewpoint is gradually changing as a result of steadily increasing interest in and study of the biology and pathology of astrocytes. Over the past 25 years it has become clear that astrocytes are responsible for a wide variety of complex and essential functions in the healthy CNS, including primary roles in synaptic transmission and information processing by neural circuit functions. The functions and mechanisms of reactive astrogliosis and glial scar formation are gradually being elucidated. There is a growing body of evidence that points towards the potential for loss of normal astrocyte functions or gain of abnormal effects to contribute to, or play primary roles in, disease processes, and there are now numerous examples of astrocyte contributions to clinical and pathological mechanisms [15, 52, 212, 224, 225, 226, 237]. This article summarizes recent advances in (1) astrocyte functions in healthy tissue, (2) the gradations, mechanisms, functions, and effects of reactive astrogliosis, and (3) the appearance and potential roles of reactive astrocytes in a variety of CNS disorders and pathologies. Since the late nineteenth century, astrocytes have been divided into two main subtypes, protoplasmic or fibrous, on the basis of differences in their cellular morphologies and anatomical locations . These two main categories retain their validity and usefulness today. Protoplasmic astrocytes are found throughout all gray matter and, as first demonstrated using classical silver impregnation techniques, exhibit a morphology of several stem branches that give rise to many finely branching processes in a uniform globoid distribution (Fig. 1a). Fibrous astrocytes are found throughout all white matter and exhibit a morphology of many long fiber-like processes . Classical and modern neuroanatomical studies also indicate that both astrocyte subtypes make extensive contacts with blood vessels (Fig. 1a, b). Electron microscopic analyses of the mid-twentieth century revealed that the processes of protoplasmic astrocytes envelop synapses and that the processes of fibrous astrocytes contact nodes of Ranvier, and that both types of astrocytes form gap junctions between distal processes of neighboring astrocytes . These basic attributes of astrocyte morphology and some of their functional interactions are summarized schematically in (Fig. 2a). Immunohistochemical techniques that enable the detection of specific molecular markers at the single-cell level are essential tools for identifying and characterizing cells in healthy and pathological tissue. Expression of glial fibrillary acid protein (GFAP) has become a prototypical marker for immunohistochemical identification of astrocytes. Nevertheless, it is important to recognize the appropriate uses and limitations of GFAP as an astrocyte marker. GFAP was first isolated as a protein highly concentrated in old demyelinated plaques from multiple sclerosis patients and was then found to be associated immunohistochemically with reactive astrocytes in such plaques and in other pathological contexts [62, 63]. In line with this original mode of identification, GFAP expression can be regarded as a sensitive and reliable marker that labels most, if not all, reactive astrocytes that are responding to CNS injuries (Fig. 3). However, GFAP is not an absolute marker of all non-reactive astrocytes and is often not immunohistochemically detectable in astrocytes in healthy CNS tissue or remote from CNS lesions (Figs. 3a, 4a). 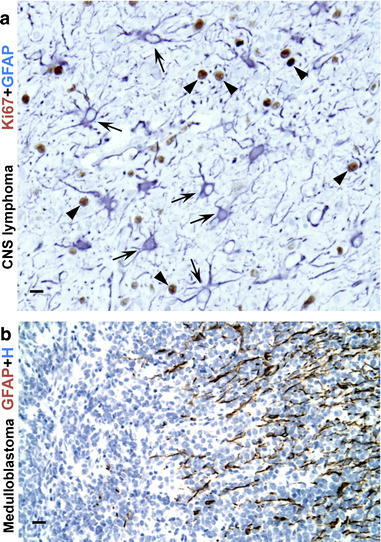 Although GFAP is immunohistochemically detectable in many astrocytes throughout the healthy CNS, it is clear from double staining with multiple markers (including transgenic reporter proteins) that many mature astrocytes in healthy CNS tissue do not express detectable levels of GFAP and that GFAP expression by astrocytes exhibits both regional and local variability that is dynamically regulated by a large number of inter- and intra-cellular signaling molecules . GFAP has been studied extensively. GFAP is one of a family of intermediate filament proteins, including vimentin, nestin, and others, that serve largely cyto-architectural functions . Studies in transgenic mice indicated that the expression of GFAP is not essential for the normal appearance and function of most astrocytes in healthy CNS of transgenic mice, but is essential for the process of reactive astrogliosis and glial scar formation [95, 179, 180]. There are different isoforms and splice variants of GFAP including GFAP α, β, γ, δ, and κ, and these may be expressed in a heterogeneous manner in both healthy CNS and in pathological specimens including glioma, but the differential distribution and roles of GFAP isoforms are only beginning to be studied [4, 20, 195]. At the single-cell level, in line with its structural role, GFAP is not present throughout astrocyte cytoplasm, and GFAP immunohistochemistry does not label all portions of the astrocyte but only in the main stem branches (Fig. 1b). GFAP is entirely absent from the finely branching astrocyte processes and is often not detectably present in the cell body (Figs. 1b, 3a). Consequently, GFAP immunohistochemistry can markedly underestimate the extent of astrocyte branching and territory in comparison with other means of detection such as Golgi staining (Fig. 1a) or expression of reporter proteins such as GFP or β-galactosidase (Fig. 1b), or filling with fluorescent dyes . In addition, as regards the use of GFAP as an astrocyte marker, it is important to note that GFAP expression is not exclusive to protoplasmic and fibrous astrocytes. 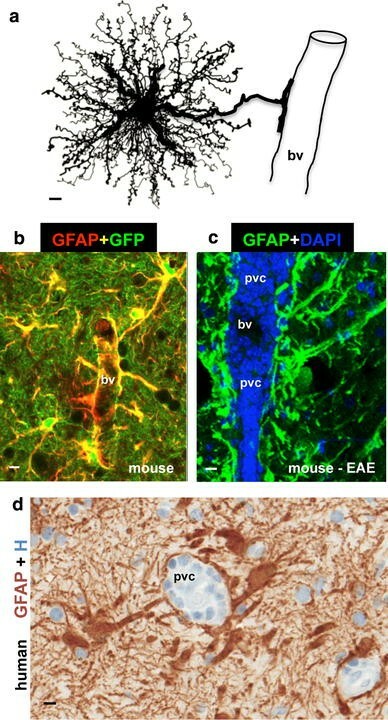 Within the CNS, GFAP is also expressed by a number of cells that can be considered part of an extended astroglial family that is described in more detail below. Outside of the CNS, GFAP is expressed widely in many tissues by a variety of cell types, also discussed below. Other molecular markers that have been used for immunohistochemical identification of astrocytes and reactive astrocytes include glutamine synthetase and S100β [85, 165], but these molecules are not entirely exclusive to astrocytes. Several recent studies have conducted large-scale genetic analysis of the astrocyte transcriptome in rodents and humans, and have identified large numbers of molecules enriched in astrocytes as compared with other neural cells such as neurons and oligodendrocytes [35, 129]. Such studies will provide a rich resource for identifying molecules for mechanistic analyses of functions and roles of astrocytes and reactive astrocytes. In addition, such studies are identifying potential candidates for additional, and better, molecular markers with which to identify astrocytes. One such candidate appears to be the protein Aldh1L1, whose promoter reliably targets the expression of reporter molecules such as GFP (green fluorescent protein) to astrocytes and whose identification by immunohistochemistry may provide a sensitive chemical marker for most if not all astrocytes in healthy tissue . Astrocytes tile the entire CNS in a contiguous and essentially non-overlapping manner that is orderly and well organized (Fig. 3a). There are no CNS regions devoid of astrocytes or closely related cells. Dye filling of individual cells and other anatomical techniques have demonstrated that in healthy CNS, individual protoplasmic astrocytes have essentially non-overlapping domains in gray matter, such that only the most distal tips of processes from individual astrocytes interdigitate with one another and thereby provide the substrate for formation of the gap junctions detected at the ultrastructural level [34, 91, 162, 172]. Similar individual astrocyte domains appear likely to exist in white matter, but this has not yet been as extensively reported on. Individual protoplasmic astrocytes typically extend from five to ten main stem branches, each of which gives rise to many finely branching processes that are evenly distributed throughout the astrocyte domain in the gray matter. In hippocampus or cortex many finely branching processes from a single astrocyte are estimated to contact several hundred dendrites from multiple neurons and to envelope 100,000 or more synapses [34, 91, 172]. It is also noteworthy that human astrocytes are larger, structurally more complex, and more diverse than astrocytes in rodents . Astrocytes express potassium and sodium channels and can exhibit evoked inward currents, but unlike neurons, astrocytes do not ‘fire’ or propagate action potentials along their processes [162, 212]. However, this does not mean that astrocytes are physiologically ‘silent’. Astrocytes exhibit regulated increases in intracellular calcium concentration [Ca++]i that represent a form of astrocyte excitability [39, 46]. A large body of evidence is now available that these regulated increases in astrocyte [Ca++]i are of functional significance in astrocyte–astrocyte as well as in astrocyte–neuron intercellular communication. Astrocyte [Ca++]i elevations can (1) occur as intrinsic oscillations resulting from Ca++ released from intracellular stores, (2) be triggered by transmitters (including glutamate and purines) released during neuronal activity, (3) elicit the release from astrocytes of transmitters such as glutamate into the extracellular space and thereby trigger receptor mediated currents in neurons, and (4) be propagated to neighboring astrocytes [89, 162, 182, 215, 249]. Evidence that calcium signaling enables astrocytes to play a direct role in synaptic transmission is discussed below. It is also noteworthy that astrocytes can couple to neighboring astrocytes through gap junctions (Fig. 2a) formed by connexins, and that the gap junctional coupling of astrocytes into multicellular networks may play a role in both normal function and CNS disorders [162, 212]. The developmental generation of astrocytes tends to occur after the initial production of neurons in many CNS regions. Nevertheless, astrocytes exert a number of important functions during development of both gray and white matter. Molecular boundaries formed by astrocytes take part in guiding the migration of developing axons and certain neuroblasts . In addition, substantive evidence is accumulating that astrocytes are essential for the formation and function of developing synapses by releasing molecular signals such as thrombospondin [15, 43, 243]. Astrocytes appear also to influence developmental synaptic pruning by releasing signals that induce expression of complement C1q in synapses and thereby tag them for elimination by microglia [15, 230]. As regards the development of white matter, the loss or dysfunction of astrocyte connexins and gap junctions leads to dysmelination . Astrocytes make extensive contacts with (Fig. 1a, b) and have multiple bidirectional interactions with blood vessels, including regulation of local CNS blood flow. Recent findings show that astrocytes produce and release various molecular mediators, such prostaglandins (PGE), nitric oxide (NO), and arachidonic acid (AA), that can increase or decrease CNS blood vessel diameter and blood flow in a coordinated manner [86, 102]. Moreover, astrocytes may be primary mediators of changes in local CNS blood flow in response to changes in neuronal activity . Astrocytes have processes in contact with both blood vessels and synapses (Fig. 2a). Via these contacts, astrocytes titrate blood flow in relation to levels of synaptic activity, as demonstrated recently in the visual cortex where fMRI detected changes in blood flow in response to visual stimuli were shown to be dependent on astrocyte function [211, 260]. Astrocyte processes envelop essentially all synapses [27, 183] and exert essential functions in maintaining the fluid, ion, pH, and transmitter homeostasis of the synaptic interstitial fluid in a manner that is critical for healthy synaptic transmission (Fig. 2a). Astrocyte processes are rich in the aquaporin 4 (AQP4) water channel and in transporters for the uptake of K+ [212, 220, 264]. Astrocyte membranes have different means of proton shuttling, including the Na+/H+ exchanger, bicarbonate transporters, monocarboxylic acid transporters, and the vacuolar-type proton ATPase . AQP4 water channels are densely clustered along astrocyte processes that contact blood vessels and play a critical role in regulating fluid homeostasis in healthy CNS and play roles in both vasogenic and cytotoxic edema as discussed below. Astrocyte processes at synapses also play essential roles in transmitter homeostasis by expressing high levels of transporters for neurotransmitters such as glutamate, GABA, and glycine that serve to clear the neurotransmitters from the synaptic space [205, 212]. After uptake into astrocytes, the transmitters are converted by enzymes such as glutamine synthetase into precursors such as glutamine and recycled back to synapses for reconversion into active transmitters (Fig. 2a). Networks of astrocytes linked together by gap junctions are thought to be able to rapidly dissipate small molecules such as potassium and glutamate and prevent their potentially detrimental accumulation (Fig. 2a) . There is now steadily accumulating evidence that astrocytes play direct roles in synaptic transmission through the regulated release of synaptically active molecules including glutamate, purines (ATP and adenosine), GABA, and D-serine [89, 162, 182, 215]. The release of such gliotransmitters occurs in response to changes in neuronal synaptic activity, involves astrocyte excitability as reflected by increases in astrocyte [Ca++]i, and can alter neuronal excitability [89, 162, 182, 215]. Such evidence has given rise to the ‘tripartite synapse’ hypothesis, which posits that astrocytes play direct and interactive roles with neurons during synaptic activity in a manner that is essential for information processing by neural circuits [5, 89, 182]. In addition to having direct effects on synaptic activity via the release of gliotransmitters, astrocytes have the potential to exert powerful and long-term influences on synaptic function through the release of growth factors and related molecules. As discussed above, molecular mechanisms have been identified through which astrocytes play a role in the formation, maintenance, and pruning of synapses during development [15, 43, 230]. Such mechanisms may also provide astrocytes with the means of exerting powerful influences on synaptic remodeling and pruning in the healthy adult CNS or in response to CNS disorders . Cytokines such as tumor necrosis alpha (TNFα) have been shown to influence homeostatic synaptic scaling by inducing the insertion of AMPA receptors at post-synaptic membranes . Although it is not certain whether astrocytes or microglia are primary sources of TNFα in the CNS in vivo, the effects on synaptic function of astrocyte-derived growth factors and cytokines warrant further study. Astrocytes are also sources of neuroactive steroids (neurosteroids), including estradiol, progesterone and various intermediaries and metabolites that can have synaptic effects, particularly at GABAA receptors . A growing body of evidence also now indicates that astrocytes make important contributions to CNS metabolism. Astrocytes, which have processes that on the one hand contact blood vessels and on the other hand contact neuronal perikarya, axons (at nodes of Ranvier), and synapses, are well positioned to take up glucose from blood vessels and furnish energy metabolites to different neural elements in gray and white matter (Fig. 2a). Although it was known for many years that astrocytes are the principal storage sites of glycogen granules in the CNS and that the greatest accumulation of astrocytic glycogen occurs in areas of high synaptic density [183, 184], the functional contribution of these stores was originally discounted . Compelling evidence now demonstrates that astrocytic glycogen utilization can sustain neuronal activity during hypoglycemia and during periods of high neuronal activity [27, 231]. In this regard, it is noteworthy that astrocyte glycogen content can be modulated by transmitters such as glutamate  and that glucose metabolites can be passed across gap junctions in a manner that is regulated by glutamate and neuronal activity . Other lines of evidence indicate that during hypoglycemia, astrocyte glycogen breaks down to lactate that is transferred to adjacent neural elements (both synapses in gray matter and axons in white matter) where it is used aerobically as fuel [27, 28, 181, 252]. In addition, computer-based modeling studies suggest that during periods of high neuronal activity, inhibition of phosphofructokinase leads to impairment of neuronal glycolysis, with the consequence that lactate effluxed from astrocytes becomes the preferred energy substrate for neurons . The blood brain barrier (BBB) is a diffusion barrier that impedes the influx into brain parenchyma of certain molecules on the basis of polarity and size [1, 11]. The principal cellular constituents of the BBB are cerebral capillary endothelial cells that form tight junctions and are surrounded by a basal lamina, perivascular pericytes, and astrocyte endfeet. The role of pericytes in BBB function is not well studied and the role of astrocytes is controversial. The main functional components of the BBB are the endothelial tight junctions [1, 11]. Numerous lines of in vitro evidence indicate that astrocytes can induce barrier properties in cerebral and other endothelial cells as well as in related epithelial, arguing in favor of a role for astrocytes in BBB induction [1, 11, 17, 208]. In contrast, certain aspects of the BBB become functional in vivo before the appearance of astrocytes during development [93, 206]. In this regard, it is interesting to note that embryonic neural progenitor cells are able to induce BBB properties in cerebral endothelial cells . Other studies suggest a role for astrocytes in regulating BBB properties of cerebral endothelial in vivo in adult mice through specific BMP signaling mechanisms on astrocyte endfeet that when disrupted cause BBB leaks . In addition, both astrocytes and related enteric glial cells are able to induce barrier properties in gut epithelial cells and the molecule GSNO has been identified as a molecular mediator of this effect . Additional studies will be needed to clarify the roles of astrocytes and pericytes in BBB function and to identify molecular mediators that may induce BBB properties in cerebral endothelia. It is possible that different cell types provide such factors at different times during development and in healthy or injured CNS. The increasing awareness of the complexity, importance, and diversity of astrocyte functions is giving rise to a growing interest in the potential for specialization and heterogeneity among astrocytes . The notion of astrocyte heterogeneity is not new. Numerous anatomical distinctions have long been recognized among gray (protoplasmic) and white (fibrous) matter astrocytes in different CNS regions , but these have long been over looked or discounted. In addition, there is a long-standing recognition of an extended family of astroglial cells that share similarities with, but also exhibit differences to, protoplasmic and fibrous astrocytes, including Müller glia in the retina, Bergmann glia of the cerebellum, tanycytes at the base of the third ventricle, pituicytes in the neurohypophysis, cribrosocytes at the optic nerve head, and others. These different cell types express various astrocyte-related molecules such as GFAP, S100β, glutamine synthetase and others, and exert functions similar to astrocytes in manners specialized to their locations. In addition, these different types of astroglial cells share with astrocytes the ability to become reactive in response to CNS insults and these cells have the potential to play important roles in pathological changes in their specific locations as discussed below. As regards protoplasmic and fibrous astrocytes, various lines of evidence suggest that there is considerable molecular, structural, and potentially functional diversity of astrocytes at both the regional and local levels, but such investigations are at an early stage [10, 96]. In this context it is interesting to note that the number, complexity, and diversity of astroglial cells associated with neurons has increased considerably with evolution, such that the ratio of astrocytes to neurons is 1:6 in worms, 1:3 in rodent cortex, and 1.4:1 in human cortex, implying that astrocyte roles increase in importance with sophistication of neural tissue . The human cerebral neocortex contains multiple subtypes of astrocytes, including types that do not appear to exist in rodent cortex . As molecular markers become more sophisticated, it seems likely that astrocytes will be revealed to be considerably more heterogeneous than thus far imagined. Such information is likely to impact on concepts about astrocyte roles in both health and disease. Recent studies have identified specific morphological and chemical phenotypes of neural stem cells (NSC) in embryonic, juvenile, and adult brain. In the embryonic brain, it is now clear that radial cells are NSC that give rise to cortical pyramidal neurons [116, 134, 164]. As these radial cells mature, they adopt GFAP expression and some give rise to GFAP-expressing radial NSC that persist in juvenile and adult forebrain, while others become astrocytes [116, 122, 142]. Some GFAP-expressing radial NSC remain constitutively active throughout life in the subependymal (or subventricular) zone of the lateral ventricles and in the subgranular zone of the hippocampal dentate gyrus, where they are the predominant source of adult neurogenesis [56, 78, 103, 214]. Based almost entirely on the observation that these adult NSC express GFAP, they have been referred to by some authors as a ‘sub-type’ of astrocyte [56, 116], but it is not clear that such a nomenclature is either warranted or useful [14, 84, 153]. There is ample evidence that GFAP is not an exclusive marker of astrocytes. Moreover, as described above, protoplasmic and fibrous astrocytes are highly differentiated and specialized cells that exert a wide variety of complex activities essential for neural function in the healthy CNS, and at present there is no evidence that GFAP-expressing adult radial NSC exert any of the complex functions of mature differentiated protoplasmic and fibrous astrocytes. In addition, there is clear evidence that mature adult astrocytes are not neurogenic. Differentiated astrocytes in uninjured mature cerebral cortex do not exhibit neurogenic potential either in vivo or in vitro . Even proliferating reactive astrocytes after CNS trauma give rise only to other astrocytes and do not spontaneously exhibit multipotent neurogenic potential unless they are reprogrammed genetically or by exposure to high doses of specific growth factors in vitro [29, 30]. In addition, GFAP-expressing NSC differ in morphology (radial phenotype), chemical phenotype (LeX and nestin expression), and physiological characteristics from protoplasmic and fibrous astrocytes [78, 104, 126]. Thus, the majority of currently available evidence argues that juvenile and adult NSC share more similarities with embryonic radial NSC than with mature astrocytes. There seems to be no reason to label the multipotent neural progenitors that persist throughout life as a subtype of astrocyte, which risks the blurring of clear functional distinctions among cell types. Instead, it seems that clarity would best be served by referring to these progenitors simply as either juvenile or adult radial NSC, in keeping with their derivation and phenotype. It has been argued that it may be useful to return to the nomenclature of early neuroanatomists who referred to such radial progenitor cells as ‘neuroepithelial cells’ rather than glia [14, 153]. Regardless of nomenclature, the presence in certain forebrain areas of GFAP-expressing cells that have constitutive multipotent NSC potential throughout life has important implications for concepts regarding various CNS disorders, in particular CNS neoplasms, as discussed below. There are many cells that have morphological and functional similarities to astrocytes outside of the CNS in both neural and non-neural tissues. Peripheral ganglia contain satellite cells that express GFAP and envelope neurons. Peripheral nerves contain non-myelinating Schwann cells that express GFAP and surround non-myelinated axons. The enteric nervous system contains a vast population of GFAP-expressing enteric glia that extends throughout the different neural plexuses. Enteric glia surround neuronal cell bodies and axons, as well as contact blood vessels and epithelial cells, and are likely to take part in many gut functions in manners that are similar to astrocytes [32, 202]. GFAP is expressed widely in many tissues by a variety of cell types including mesenchymal stellate cells that share structural and functional similarities with astrocytes in many organs, including liver, kidney, pancreas, lungs, and testes [32, 124, 266]. The functional roles of these cells and their potential similarities with astrocytes are only beginning to be explored, but some appear to share with astrocytes functions in tissue repair and scar formation, as well as newly discovered roles as regulators of local immune and inflammatory responses. Although reactive astrogliosis is used widely as a pathological hallmark of diseased CNS tissue, definitions of reactive astrogliosis can vary considerably among authors and there are no widely accepted categories of intensity or severity. Based on a large body of observations in experimental animals, a definition of reactive astrogliosis has recently been proposed  that encompasses four key features: (1) reactive astrogliosis is a spectrum of potential molecular, cellular and functional changes in astrocytes that occur in response to all forms and severities of CNS injury and disease including subtle perturbations, (2) the changes undergone by reactive astrocytes vary with severity of the insult along a gradated continuum of progressive alterations in molecular expression, progressive cellular hypertrophy, and in severe cases, proliferation and scar formation, (3) the changes of reactive astrogliosis are regulated in a context-specific manner by inter- and intra-cellular signaling molecules, (4) the changes undergone during reactive astrogliosis have the potential to alter astrocyte activities both through gain and loss of functions that can impact both beneficially and detrimentally on surrounding neural and non-neural cells . Here, we propose to apply and extend this definition to identifying different gradations of reactive astrogliosis and glial scar formation that may be encountered in histopathological examinations of human disorders (Figs. 3, 4). According to this definition, reactive astrogliosis is not an all-or-none response, nor is it a single uniform process, nor is it ubiquitously synonymous with scar formation. Instead, reactive astrogliosis is a finely gradated continuum of progressive changes in gene expression and cellular changes. Although the increasing severities of reactive astrogliosis transition seamlessly along a continuum, it is convenient for purposes of description and classification to recognize three broad categories. In mild or moderate reactive astrogliosis there is variable up regulation of expression of GFAP and other genes , as well as hypertrophy of cell body and processes that can vary in degree but that occurs within the domains of individual astrocytes  without substantive intermingling or overlap of processes of neighboring astrocytes or loss of individual domains (Figs. 3b, 4b) . There is little or no astrocyte proliferation in mild or moderate reactive astrogliosis; however, the up regulation of GFAP expression in astrocytes that do not express detectable levels of GFAP in healthy tissue (Figs. 3a, 4a) can lead to the staining of more cells (Figs. 3b, 4b), sometimes giving the false impression of proliferation. Mild or moderate reactive astrogliosis is generally associated with mild non-penetrating and non-contusive trauma, diffuse innate immune activation (viral infections, system bacterial infections), and in areas that are some distance to focal CNS lesions. Because there is little or no reorganization of tissue architecture, if the triggering mechanism is able to resolve, then mild or moderate reactive astrogliosis exhibits the potential for resolution in which the astrocytes return to an appearance similar to that in healthy tissue . The physiological consequences of mild or moderate reactive astrogliosis are not well understood. In severe diffuse reactive astrogliosis there is pronounced up regulation of expression of GFAP and other genes, together with pronounced hypertrophy of cell body and processes, as well as astrocyte proliferation, resulting in considerable extension of processes beyond the previous domains of individual astrocytes. As a result, there is substantive intermingling and overlapping of neighboring astrocyte processes with blurring and disruption of individual astrocyte domains (Figs. 3c, 4c). These changes can result in long-lasting reorganization of tissue architecture that can extend diffusely over substantive areas without the formation of dense, compact barriers as found in glial scars along borders to necrotic tissue (see below). Severe diffuse reactive astrogliosis is generally found in areas surrounding severe focal lesions, infections or areas responding to chronic neurodegenerative triggers. Severe reactive astrogliosis with compact glial scar formation includes changes associated with milder forms, such as pronounced up regulation of GFAP and other genes, and pronounced hypertrophy of cell bodies and processes. In addition, glial scar formation progresses beyond these changes with groups of reactive astrocytes that exhibit pronounced overlapping of reactive astrocyte processes, obliteration of individual astrocyte domains, evidence of substantive astrocyte proliferation, and the clear formation of dense, narrow, and compact glial scars (Fig. 4d). Recent experimental evidence indicates that these astrocyte scars act as neuroprotective barriers to inflammatory cells and infectious agents, and that they form in particular along borders to severe tissue damage, necrosis, infection or autoimmune-triggered inflammatory infiltration (Fig. 4d) [33, 59, 68, 95, 226, 251]. An important feature of these glial scars is the interaction of reactive astrocytes with other cell types, in particular fibromeningeal and other glial cells (Fig. 4d) [31, 95], and the deposition of a dense collagenous extracellular matrix that contains many molecular cues that inhibit axonal and cellular migration . Triggering insults include penetrating trauma, severe contusive trauma, invasive infections or abscess formation, neoplasm, chronic neurodegeneration, systemically triggered inflammatory challenges. It is noteworthy that the glial scar formation is associated with substantive tissue reorganization and structural changes that are long lasting and persist long after the triggering insult may have resolved. The findings summarized here show that there are pronounced differences along the continuum of potential responses of reactive astrocyte to insults of different kinds and severities. These differences are likely to be of consequence when considering the functions and impact of reactive astrogliosis on CNS disorders and pathologies, as discussed below. The contribution of astrocyte proliferation to reactive astrogliosis warrants specific consideration. The widespread and often exclusive use of GFAP as a marker for astrocytes has led to a tendency to overestimate the contribution of astrocyte proliferation to reactive astrogliosis. 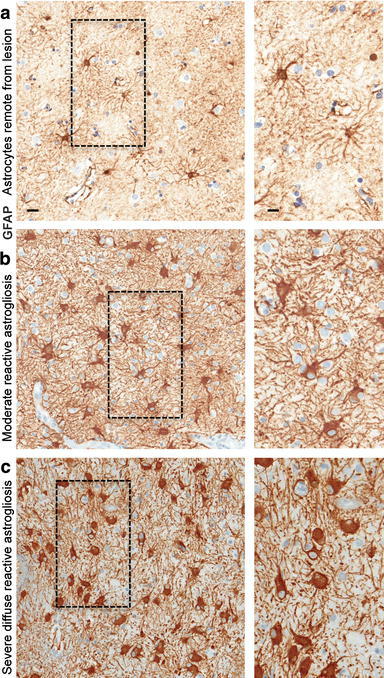 As discussed above, many astrocytes in healthy CNS do not express GFAP at immunohistochemically detectable levels, or express only very low levels (Figs. 3a, 4a). During mild or moderate astrogliosis, there is a marked up regulation of GFAP expression as well as cellular hypertrophy in essentially all astrocytes, which can lead to the false impression of an increase in astrocyte number because more astrocytes are immunohistochemically stained and the larger astrocytes seem more densely packed (Figs. 3b, 4b). In healthy CNS tissue, astrocyte turnover is low and there are few proliferating or newly generated astrocytes and it appears that the majority of astrocytes are post-mitotic and long-lived [33, 45, 97, 167]. 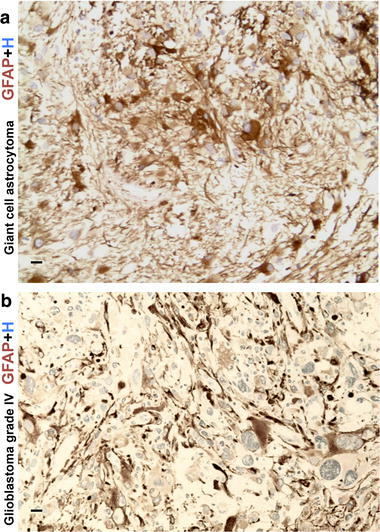 Experimental analysis of cell proliferation indicates that GFAP up regulation and hypertrophy can occur in mild or moderate astrogliosis in the absence of proliferation and increase in cell number . The appearance of newly proliferated astrocytes occurs in severe diffuse reactive astrogliosis and severe reactive astrogliosis with compact glial scar formation as discussed above (Figs. 3c, 4c, d). In human specimens, actively dividing reactive astrocytes have been particularly reported in association with infection and acute demyelinating lesions . The source of newly divided scar-forming astrocytes is not well established, and may include mature astrocytes that re-enter the cell cycle as well as progenitor cells in the local parenchyma or in the periventricular regions [30, 33, 37, 77, 133, 141, 226]. Many different types of intercellular signaling molecules are able to trigger reactive astrogliosis or to regulate specific aspects of reactive astrogliosis, including (1) large polypeptide growth factors and cytokines such as IL6, LIF, CNTF, TNFα, INFγ, Il1, Il10, TGFβ, FGF2, etc., (2) mediators of innate immunity such as lipopolysaccharide (LPS) and other Toll-like receptor ligands, (3) neurotransmitters such as glutamate and noradrenalin, (4) purines such as ATP, (5) reactive oxygen species (ROS) including nitric oxide (NO), (6) hypoxia and glucose deprivation, (7) products associated with neurodegeneration such as β-amyloid, (8) molecules associated with systemic metabolic toxicity such as NH4 +, and (9) regulators of cell proliferation such endothelin-1, as reviewed in detail elsewhere . Such molecular mediators of reactive astrogliosis can be released by all cell types in CNS tissue, including neurons, microglia, oligodendrocyte lineage cells, pericytes, endothelia, and other astrocytes, in response to all forms of CNS insults, ranging from subtle cellular perturbations that release some of the specific factors just listed, to cell stretching as might be encountered during acceleration/deceleration CNS injury and which releases ATP, to intense tissue injury and cell death that release various intracellular molecules that signal intense tissue damage (Fig. 2b) . It is also becoming clear that different molecular, morphological, and functional changes in reactive astrocytes are specifically controlled by inter- and intra-cellular signaling mechanisms that reflect the specific contexts of the stimuli and produce specific and gradated responses of reactive astrogliosis . For example, the different intracellular signaling pathways associated with STAT3, NFκB, SOCS3, Nrf2, cAMP, Olig2 are implicated in mediating different aspects or different degrees of reactive astrogliosis such as GFAP up regulation, cell hypertrophy, proliferation, and pro- or anti-inflammatory effects . Molecular triggers that lead to proliferation of reactive astrocytes in vivo are incompletely characterized but include EGF, FGF, endothelin 1, and ATP [77, 121, 161]. Concepts about reactive astrogliosis have long been dominated by the recognition over 100 years ago that scars formed by reactive astrocytes inhibit axon regeneration and by the interpretation that this scar formation was the main impediment to functional recovery after CNS injury or disease . The ensuing over 100-year-long emphasis on glial scar formation as an inhibitor of axon regeneration has often led to a generalized negative view of reactive astrogliosis per se, and there has been a tendency among certain authors to typecast the entire process of reactive astrogliosis as a uniformly negative and maladaptive phenomenon that unavoidably causes neurotoxicity, inflammation, or chronic pain. This stereotyped viewpoint has sometimes led to the simplistic notion that total inhibition of reactive astrogliosis can be regarded as a therapeutic strategy. This absolutely negative viewpoint of reactive astrogliosis is no longer tenable and it is now clear from many different lines of experimental evidence that there is a normal process of reactive astrogliosis that exerts essential beneficial functions and does not do harm. As reviewed in detail elsewhere , many studies using transgenic and experimental animal models provide compelling evidence that reactive astrocytes protect CNS cells and tissue by (1) uptake of potentially excitotoxic glutamate [33, 198, 234], (2) protection from oxidative stress via glutathione production [42, 216, 234, 245], (3) neuroprotection via adenosine release , (4) protection from NH4 + toxicity , (5) neuroprotection by degradation of amyloid-beta peptides , (6) facilitating blood brain barrier repair , (7) reducing vasogenic edema after trauma, stroke or obstructive hydrocephalus [33, 264], (8) stabilizing extracellular fluid and ion balance and reducing seizure threshold , and (9) limiting the spread of inflammatory cells or infectious agents from areas of damage or disease into healthy CNS parenchyma [33, 59, 68, 95, 123, 156, 175, 251]. Of particular interest as regards functions of reactive astrocytes, is recent evidence that reactive astrogliosis and glial scar formation play essential roles in regulating CNS inflammation . In response to different kinds of stimulation, reactive astrocytes can make many different kinds of molecules with either pro- or anti-inflammatory potential [60, 108] and reactive astrocytes can exert both pro- and anti-inflammatory effects on microglia [67, 148]. A large body of experimental studies indicates that reactive astrocytes can exert both pro- and anti-inflammatory regulatory functions in vivo in a context dependent manner that is regulated by specific molecular signaling pathways . A functional model, which may reconcile the apparent paradox that reactive astrocytes have the potential to exert both pro- and anti-inflammatory activities, is that reactive astrocytes exert different activities at different times after insults, or in different geographical locations in relation to lesions, as determined by context-specific signaling mechanisms. For example, reactive astrocytes may exert pro-inflammatory roles at early times after insults and in the center or immediate vicinity of lesions, but exert anti-inflammatory roles at later times and at the borders between lesions and healthy tissue. In cases of severe lesions, reactive astrocytes may form scars that act as cell migration barriers around the borders of areas where intense inflammation is needed and thereby restrict the spread of inflammatory cells and infectious agents into adjacent healthy tissue (Fig. 4d) [225, 226]. Together, these findings indicate that there is a normal process of reactive astrogliosis and glial scar formation that exerts various beneficial functions including protecting neural cells and function, restricting the spread of inflammation and infection, and promoting tissue repair. It is important to distinguish this normal process from the potential for dysfunction of reactive astrocytes to contribute to CNS disorders. Astrocytes and reactive astrocytes have the potential to impact on essentially all aspects of neural function through regulation of blood flow, provision of energy substrates, or by influencing synaptic function and plasticity. Increasing evidence indicates that dysfunctions of the process of reactive astrogliosis and scar formation have the potential to contribute to, or to be primary causes of, CNS disease mechanisms either through loss of normal functions or through gain of detrimental effects . As discussed earlier, in healthy neural tissue, astrocytes play critical roles in many functions, including regulation of blood flow, homeostasis of extracellular fluid, ions and transmitters, energy provision, and regulation of synapse function, and synaptic remodeling (Fig. 2a). In addition, different types of transgenic deletion studies show that reactive astrocytes exert a number of essential beneficial functions in response to CNS insults, including BBB repair, neural protection and restricting the spread of inflammatory cells, and infection. The disturbance or loss of these functions during the process of reactive astrogliosis has the potential to underlie neural dysfunction and pathology in various conditions including trauma, stroke, multiple sclerosis, and others. Genetic animal models are providing evidence for ways in which loss or attenuation of reactive astrocyte functions might worsen outcome after various kinds of CNS insults, for example, through excitotoxic neurodegeneration due to failure or attenuation of glutamate uptake [33, 198, 234] or increased inflammation or infection due to loss or failure of astrocyte barrier functions [33, 59, 68, 95, 251]. Clinical studies, discussed below, are also identifying a rapidly growing number of conditions that are precipitated by or exacerbated loss of functions by astrocytes or reactive astrocytes. In a manner analogous to inflammation, reactive astrogliosis also has the potential to exert detrimental effects. The prototypical gain of a detrimental effect by reactive astrogliosis and glial scar formation is the inhibition of axon regeneration, first proposed over 100 years ago and now supported by extensive molecular and cell-biological evidence . In addition, there is also evidence from both clinical (discussed below) and experimental studies that, under specific circumstances, astrocytes or reactive astrocytes have the potential to exert a variety of other detrimental effects through gain of abnormal effects. For example, reactive astrocytes can be stimulated by specific signaling cascades (Fig. 2b) to gain of detrimental effects such as (1) exacerbating inflammation via cytokine production [22, 23], (2) producing neurotoxic levels of reactive oxygen species [92, 234], (3) releasing potentially excitotoxic glutamate , (4) potential contribution to seizure genesis [106, 240], (5) compromising blood brain barrier function due to VEGF-production , (6) causing cytotoxic edema during trauma and stroke through AQP4 over activity , and (7) contributing to chronic pain . There also appears to be the potential for combinatorial signaling cascades resulting from exposure to microbial antigens such as lipopolysaccharide (LPS), to markedly increase the production of potentially toxic molecules by astrocytes [67, 92]. Context-dependent acute or chronic combinatorial signaling events (Fig. 2b) involving different cell types might thus stimulate reactive astrocytes to produce potentially cytotoxic levels of molecules or might lead to chronic inflammation or neuropathic pain. A greater understanding of such combinatorial signaling could facilitate targeted therapeutic strategies that preserve the beneficial and attenuate the potentially detrimental aspects of reactive astrogliosis. In this regard, it will also be interesting in future studies to look for genetic polymorphisms that may alter reactive astrocyte functions in certain individuals and thereby predispose them to certain disease processes. Many experimental investigations of mechanisms and functions of reactive astrogliosis and glial scar formation make use of transgenic technologies combined with experimental animal models, which has revolutionized the study of neural injury and disease by allowing in vivo dissection of molecular and cellular mechanisms . Nevertheless, in interpreting results derived from studies using transgenic mice it is important to understand associated caveats . For example, different promoters (human or mouse GFAP, GLAST, etc.) may have different targeting properties/efficiencies as regards astrocytes and related cells. Although not all astrocytes express GFAP or GFAP-regulated transgenes in healthy tissue, most if not all appear to do so after CNS injury or other insults [33, 95, 251]. It is essential that authors define transgene expression levels individually and specifically in every tissue region and experimental model being studied, as well as control for any possible confounding effects that may result from transgene expression in other cells both within and outside of the CNS [33, 95, 226, 251]. Traumatic brain and spinal cord injury are major causes of premature death, permanent physical disability, or long-lasting neuropsychiatric impairment . Reactive astrogliosis and glial scar formation are prominent features of CNS trauma and are increasingly implicated as playing important roles in determining long-term clinical outcome [41, 226]. The appearance of reactive astrogliosis after CNS trauma (whether in the brain or spinal cord) varies with the (1) type of the trauma, i.e., whether it is penetrating, contusional, or diffuse (as in the case of diffuse axonal injury), (2) severity of the trauma, (3) length of time that has elapsed between injury and biopsy or autopsy, and (4) distance of the tissue examined from the site of injury/trauma. The same specimen may exhibit different severities of reactive astrogliosis in different locations, such as a distinct glial scar along areas of damaged tissue after penetrating or severe contusive trauma (Fig. 4d), which may be surrounded by areas of decreasing severity of reactive astrogliosis (Fig. 4c) as distance away from the lesion center increases (Fig. 4b). Tissue at a considerable distance from the site of direct injury may show sequelae of transient edema and/or downstream effects such as Wallerian or trans-synaptic degeneration, or a combination of the two, significantly contributing to neurologic disability. Severe reactive astrogliosis and glial scar formation at sites of CNS trauma are well documented to inhibit axonal regeneration  and are widely regarded as detrimental to clinical outcome. Nevertheless, recent studies using transgenic mouse models indicate that scar-forming reactive astrocytes exert essential neuroprotective functions after both brain and spinal cord trauma [33, 68, 95, 144, 175, 226] as discussed earlier. Diffuse traumatic brain injury can lead to mild or moderate diffuse astrogliosis without obvious scar formation, in which reactive astrocytes hypertrophy and up regulate gene expression, including GFAP, but in which there is little or no loss of individual astrocyte domains (Figs. 3b, 4b). In animal experiments, mild to moderate reactive astrogliosis of this type exhibits the potential for resolution , but the functional consequences of these changes are not well understood. A cerebral concussion almost certainly impacts on astrocyte structure and function, but such injury is not life threatening, results in minimal if any abnormalities on neuroimaging, and is thus (by definition) not usually the subject of neuropathological review or investigation. Brain parenchyma and the blood vessels that supply it are not, as they once were, viewed as separate ‘compartments’ within the CNS. Rather, the concept of the ‘neurovascular unit’ takes an integrated view of a given brain parenchymal blood vessel and the glial elements that surround it [38, 139, 206]. Cellular elements in the vessel wall influence surrounding CNS parenchyma, just as the surrounding parenchymal elements affect vascular morphology and function. The ‘neurovascular unit’ idea becomes especially important when considering functional recovery after an ischemic infarct or ‘stroke’. From a practical diagnostic perspective, the appearance of astrocytes around a region of cystic encephalomalacia within brain that has resulted from an ischemic infarct or hemorrhage can be used to ‘date’ such a lesion (i.e., estimate how long it occurred prior to death), though not very accurately. The sequence of cellular events in an ischemic infarct progresses from intense neuronal eosinophilia (hours to 1–2 days after the insult), to influx of polymorphonuclear leukocytes (variable intensity, but usually within the same time frame), then ingress of macrophages/histiocytes (from blood or activated resident microglia) as liquefactive necrosis occurs (beginning 3–5 days after the infarct), and finally proliferation of an abundance of astrocytes that marginate and form a scar (Fig. 4d) along the borders of an infarct from about 7–10 days after ischemia and then persist for life of the patient (Fig. 5). None of these time frames are precise, particularly in aged individuals, where the process of aging, as well as the exposure to other conditions, may influence the level of reactive astrogliosis that is observed. ‘Chronic cystic infarcts’ are usually associated with astrocytic gliosis , and a characteristic finding in a cortical cystic infarct is the preservation of the relatively paucicellular molecular layer overlying it and located immediately beneath the meninges, which then develops a dense collection of astrocytes, usually with gemistocytic phenotype. Astrocytic processes usually traverse the cystic cavity left by the death of brain tissue, in a delicate meshwork, with persistence of foamy histiocytes among the glial fibers. The role of reactive astrogliosis in the evolution of ischemic brain lesions is at present uncertain, but recent studies suggest that reactive astrocytes provide essential metabolic support to neurons during transient ischemia and that failure of astrocyte functions may contribute to neuronal degeneration [196, 237]. In addition, experimental disruption of astroglial scar formation in transgenic mice after stroke is associated with loss of barrier functions along the margins of infarcts, resulting in increased spread of inflammation and increased lesion volume . Stroke may also induce neurogenesis from periventricular neural progenitor cells that express GFAP . Newly ‘born’ neuroblasts and immature neurons migrate to the infract region where they associate intimately with the cerebral microvasculature in and around the infarct, which itself is undergoing intense post-stroke remodeling. It remains to be seen whether this interesting interplay of neurogenic and vascular elements will become relevant in the treatment of human strokes. Reactive astrogliosis is prominent in most CNS infections. Astrocytes can be both targets of, as well as responders to, infectious agents, especially viruses. Subpial astrocytes are especially prominent in individuals who have survived an episode of purulent or granulomatous meningitis, and their appearance of reactivity depends in large part on how quickly antibiotic therapy was initiated. The roles of reactive astrocytes during the response to infection are only beginning to be elucidated. For example, reactive and scar-forming astrocytes accumulate prominently around microbial abscesses, and recent evidence indicates that reactive astrocytes play essential roles in restricting the spread of invading microbial agents such as Toxoplasma gondii into CNS parenchyma . These observations are consistent with the putative protective barrier functions of reactive astrocytes to infectious agents and inflammatory cells (Fig. 4d) as discussed above and elsewhere . Reactive astrogliosis can also occur in response to peripheral infections that result in circulating bacterial antigens or endotoxins, such as LPS, due to peritonitis or sepsis without direct CNS infection [105, 213]. Reactive astrocytes are prominent in different types of viral encephalitis. Astrocytes are a main target and reservoir of human herpes virus 6 in the CNS, which can cause encephalitis in both healthy and immunsuppressed patients [57, 222]. Astrocytes are also a main target of human T-lymphotropic virus type-1, leading to disturbances in glutamate homeostasis and excitotoxicity [3, 235]. In addition to being targets of certain viruses, reactive astrocytes may take part more generally in regulating CNS inflammatory responses . Perivascular cuffing, which is a common and essentially defining feature of different types of viral encephalitis, may occur as a result of barrier functions of reactive scar forming astrocytes that restrict the spread of inflammatory cells into CNS parenchyma (Fig. 1c, d) [226, 251]. Astrocyte endfeet prominently line blood vessels in healthy tissue (Fig. 1b) and become hypertrophic during encephalitis (Fig. 6a) and surround perivascular clusters of inflammatory cells (Fig. 1c, d), and experimental disruption of perivascular astrocytes leads to widespread infiltration of lymphocytes and other inflammatory cells into CNS parenchyma . Reactive astrocytes also play a role in the potential neurological complications resulting from direct HIV-1 infection of the brain, which commonly results from ‘neurotropic’ strains of HIV-1 gaining entry to the CNS. Such strains usually target microglia or macrophages (not astrocytes), and may gain entry to the brain by entering it within infected T-lymphocytes (the ‘Trojan horse’ hypothesis of CNS infection). This can eventually result in cognitive impairment, initially mild, which can progress to HIV-associated dementia (abbreviated as HAD, formerly described as AIDS dementia complex/ADC). Despite the relative efficacy of highly active antiretroviral therapy in controlling AIDS, no treatment has to date been found that consistently moderates the pathogenic events important in the evolution of HAD or that achieves neuronal protection from the effects of the virus. The majority of viral replication in the brain occurs in microglia. Astrocytes can be infected but do not appear to serve as sites of viral replication. Infected microglia and astrocytes are the main cause of neurotoxicity, which appears to result indirectly from signals exchanged between the two cell types, resulting in the secretion of potentially toxic molecules within the CNS parenchyma, both cerebral neocortex and white matter. Astrocyte dysfunction with loss of neurosupportive and neuroprotective functions, in particular disruption of glutamate homeostasis leading to synapse dysfunction and excitotoxicity are regarded as the most likely mechanisms in mediating HIV related cognitive impairment and neurodegeneration [100, 253]. HIV-1 infection of the CNS is arguably at present the most common form of brain viral infection. However, numerous other viruses can cause neurological morbidity and even mortality in individuals with a normal immune system, or in those who are immunosuppressed, regardless of whether said immunosuppression is the result of AIDS, aggressive therapy for solid tumors or hematologic malignancy, iatrogenic immunosuppression in a patient with organ or bone stem cell transplantation, or other (e.g., congenital immunodeficiency) disease. Almost all viruses, as with HIV-1 (see above), manifest tropism for various cell types within the brain or spinal cord; that tropism may include the astrocyte. Some of the herpes viruses, e.g., Herpes simplex and cytomegalovirus (the latter being a major opportunistic pathogen in the CNS of AIDS patients , infect a wide range of cell types within the CNS including astrocytes, ependyma, and microvascular endothelium. A mosquito-borne flavivirus that has recently appeared in North America, West Nile virus (WNV) infects a variety of tissues throughout the body, but within the CNS appears to favor neurons over astrocytes . ‘Neuronotropism’ of viruses is shared by other agents, e.g., the rabies virus, which also appears to spare astrocytes, though the proliferation of uninfected reactive astrocytes is an inevitable result of rabies virus-associated encephalomyelitis. JC virus, a human polyomavirus of the Polyomaviridae family, shows selective infection and eventual destruction of oligodendroglia in immunosuppressed individuals, leading to neurologic deterioration caused by progressive multifocal leukoencephalopathy (PML). JC virus may also infect astrocytes, and in situ PCR techniques suggest an even broader repertoire of cells that are vulnerable to JC virus infection [132, 250]. In this context it is also interesting to note that effector CD8+ T cells form immunological synapses with virally infected astrocytes, resulting in pronounced changes in astrocyte morphology (and presumably in function as well) as well as potential clearance of infected cells [12, 13]. When bacterial (and some fungal) microorganisms cause a leptomeningitis, a clinical imperative is to prevent this meningitis from evolving into a meningo-encephalitis or cerebritis that leads to significant injury, necrosis, and inflammation of the brain parenchyma with far more serious neurologic morbidity than an infection isolated to the subarachnoid space. The anatomic structure largely responsible for preventing parenchymal injury in the presence of meningitis is the glia limitans, formed at the pial-subarachnoid interface by plump foot processes of reactive astrocytes, fibromeningeal cells, and an overlying basement membrane, in a manner that shares similarities with glia scar formation (Fig. 4d). A breach of the glia limitans may occur because of toxins released by the inflammatory infiltrate associated with a meningitis (especially the toxic molecules released by polymorphonuclear leukocytes/PMN) or frank necrosis of brain parenchyma underlying an inflammatory infiltrate resulting from occlusion/thrombosis of meningeal vessels. Reactive astrogliosis is variable, but often prominent, in almost all forms of seizures, and is perhaps most notable in the setting of hippocampal sclerosis, the most common neuropathological substrate of intractable temporal lobe epilepsy . Astrocytes proliferate in regions of pyramidal neuron loss, usually the endfolium and CA1 segments. In mouse models of severe epilepsy, reactive astrocytes lose their non-overlapping domains and exhibit a tenfold increase in overlapping processes, concurrent with an increase in synaptic spine density . The nature of reactive astrogliotic changes varies with the intensity and duration of the seizure disorder. The morphologic substrates of epileptic disorders are becoming understood as high-resolution neuroimaging techniques guide neurosurgeons to likely ‘epileptogenic foci’, thereby enabling surgical removal and providing novel lesions for pathologic examination from patients who are relatively ‘early’ in the course of their epileptic disorder [64, 150, 152]. The neuropathological findings within the foci of cortical dysplasia found in severe intractable epilepsy include pronounced dyslamination of the neocortex, neuronal dysmorphism and massive enlargement (‘giant’ neurons), gemistocyte-like ‘balloon cells’ . Of interest is that some of these cellular elements show immunohistochemical evidence suggesting differentiation along both neuronal and astrocytic lines . The most severe examples of focal cortical dysplasia (FCD) closely resemble the tubers found within the neocortex of individuals with tuberous sclerosis complex (TSC), and cells within severe FCD or TSC tubers exhibit distinct mechanisms for activating components of insulin-signaling pathways important in cell growth and metabolism, probably reflecting a modulating effect of TSC1 and TSC2 gene products on these pathways [152, 246]. 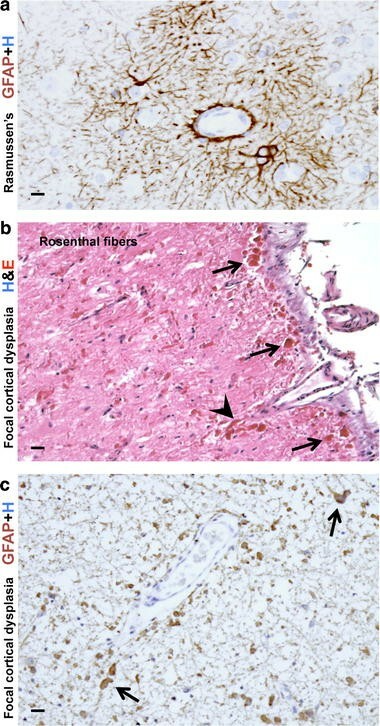 It is also interesting to note that pronounced astrocytic abnormalities have been described in severe FCD with intractable pediatric epilepsy, including astrocytes with high densities of Rosenthal fibers (Fig. 6b, c), comparable to those seen in Alexander’s disease , a genetic disorder with mutation of the GFAP gene that is also associated with seizures and other symptoms (see below). In addition to simply being passive responders to neuronal changes caused by seizure activity, various lines of recent evidence suggest that reactive astrocytes may play functional roles in mechanisms causing seizures and epilepsy, particularly in chronic relapsing forms. For example, various antiepileptic therapeutic agents block calcium-signaling in astrocytes . In mesial temporal lobe epilepsy with hippocampal sclerosis, neuropathological ultrastructural evaluations suggest that reduced levels of AQP4 and dystrophin in perivascular foot-processes of astrocytes and reactive astrocytes may lead to perturbed water flux through astrocytes with impaired buffering of K+ and an increased propensity for seizures [61, 212]. In Rasmussen’s encephalitis, seizures are associated with perivascular reactive astrogliosis and pronounced hypertrophy of astrocyte endfeet (Fig. 6a), as well as with areas of apparent astrocyte apoptosis and loss, and certain evidence suggests that autoimmune induced (cytotoxic T lymphocyte-mediated) perturbation of astrocyte function and astrocyte degeneration may contribute to the seizure disorder [16, 256]. Reactive astrocytes may also play a role in focal epilepsy following traumatic, ischemic, or infectious brain injury. Experimental evidence and modeling simulations suggest that during the BBB breakdown incurred by such insults, exposure of reactive astrocytes to albumin and other serum proteins leads to reduced clearance by reactive astrocytes of synaptic glutamate and K+ that in turn facilitate seizure-like activity and epileptogenesis [51, 74]. The CNS is affected by a number of different autoimmune inflammatory conditions. Reactive astrogliosis is a not only a prominent feature of these conditions, but various lines of evidence point towards central roles for reactive astrocytes in key pathogenic disease mechanisms discussed below. In the most common (Charcot) type of multiple sclerosis, plaques of demyelination are interspersed with and surrounded by reactive astrocytes and there are widespread regions of focal reactive astrogliosis of varying intensity throughout white matter and in some regions of gray matter [117, 130]. Astrocytes in demyelinating disease may exhibit unusual nuclear and cytological features. They may contain multiple distinct nuclei, especially in chronic disease. Such enlarged multinucleated astrocytes are often referred to as ‘Creutzfeldt astrocytes’ or ‘Creutzfeldt–Peters cells’ [65, 117, 163, 185]. The multiple nuclei within these astrocytes may be fragmented, such that the appearance of a given cell resembles an atypical or ‘granular mitosis’ of the type often encountered in high grade gliomas. Demyelinating lesions may also exhibit astrocytes that label with markers of cell division . The obvious diagnostic pitfall here is that a small biopsy from the edge of a demyelinating plaque may suggest a malignancy rather than multiple sclerosis (especially at the time of intraoperative consultation) [45, 65, 163]. Astrocytes in multiple sclerosis may also demonstrate the phenomenon of ‘emperipolesis’, i.e., an astrocyte apparently engulfing one or more other cells such as oligodendroglia  or lymphocytes . The role of this process in the pathogenesis or progression/chronicity of multiple sclerosis is not certain. It should be emphasized that both multinucleation of astrocytes and astrocyte emperipolesis also occur in other disorders, including certain tumors and longstanding spongiform encephalopathy [45, 81, 155, 217]. The roles of astrocytes in multiple sclerosis and other autoimmune inflammatory disorders are under intense investigation and are likely to be complex. Astrocytes can produce a wide variety of pro- or anti-inflammatory molecules [58, 226], and can exert potent suppressive effects on inflammatory cells . In the multiple sclerosis like model condition, experimental autoimmune encephalomyelitis (EAE), reactive astrocytes form scar like barriers around perivascular clusters of inflammatory cells (Fig. 1c), and transgenically targeted disruption of these perivascular astrocyte scars in EAE exacerbates the spread of inflammation, increases axonal degeneration, and worsens clinical signs . Nevertheless, experimental evidence suggests that reactive astrocytes can exert both pro- and anti-inflammatory roles that are essential in EAE [23, 251] and other conditions . While such findings may at first seem at odds with each other, they may be reconciled by evidence showing that reactive astrocytes take part both in attracting inflammatory cells to specific sites and in restricting inflammatory cells to those sites by limiting their spread into adjacent healthy CNS parenchyma . Such findings further suggest that the loss of normal functions or the gain of abnormal effects by reactive astrocytes may contribute to disease mechanisms in multiple sclerosis and other autoimmune inflammatory conditions. Consistent with this idea is the recent observation that the majority (>90%) of patients with neuromyelitis optica, a CNS inflammatory/demyelinating disease that was once considered a rare variant of multiple sclerosis, have autoantibodies to aquaporin-4, which is expressed in the CNS only on astrocyte foot processes and that the severity of clinical signs and spinal cord lesions in such patients correlate with aquaporin-4 specific antibody titers [119, 236]. The potential involvement of astrocytes in other autoimmune inflammatory conditions that sometimes exhibit CNS involvement, such as systemic lupus erythematosus, has been suggested but has not been extensively investigated . Astrocytes have several mechanisms through which they can influence water balance and the potential for edema, including ion channels and pumps, the water channel AQP4 and the production of molecules such as vascular endothelial growth factor (VEGF) or NO that influence endothelial cell permeability. The role of astrocytes in edema is complex and likely to be context dependent. Although excess uptake of water through AQP4 on astrocyte endfeet can lead to cytotoxic edema [135, 157, 264], the loss of astrocytes or the failure of astrocyte AQP4 channels can also lead to vasogenic edema or accumulation of extracellular fluid [33, 157, 177, 264]. Integrity of the BBB is lost after many types of CNS insults including trauma and stroke. The role of astrocytes in loss or repair of BBB functions is not well understood. A role for astrocytes is suggested by studies in transgenic mice in which ablation of reactive astrocytes after CNS trauma prevented the normally occurring repair of the BBB and grafts of normal astrocyte were able to restore BBB repair . It is not yet known whether a primary dysfunction of astrocytes or reactive astrocytes could lead to loss of BBB integrity. It is possible that loss of astrocyte production of a potential BBB inductive molecule, such as GSNO , or astrocyte over production of BBB disrupting molecules might lead to loss of BBB integrity [69, 188]. Hepatic encephalopathy can lead to mild to severe neuropsychiatric symptoms, brain edema with increased intracranial pressure associated with cerebellar tonsillar, uncal and/or central diencephalic herniation, and coma. Astrocytes are now recognized as playing a central role in the pathophysiology of hepatic encephalopathy . The brain edema is largely a result of astrocyte swelling, which in turn is caused by astrocytic uptake of NH4 +. Although astrocyte uptake of NH4 + is regarded initially as a neuroprotective mechanism, it also drives the synthesis of glutamine from glutamate by glutamine synthetase, resulting in changes in transmitter homeostasis that may contribute to behavioral symptoms. The accumulation of glutamine in astrocytes also leads to osmotic stress that results in astrocyte swelling and progressive cytotoxic edema [107, 166, 193]. Niemann-Pick type C, is an inherited neurovisceral lipid storage disorder caused by loss of function mutations of the membrane-bound protein, NPC1, which is thought to play a role in trafficking of cholesterol and other lysosomal cargo. In the CNS, NPC1 is expressed predominantly in perisynaptic astrocyte processes that are closely associated with nerve terminals, the earliest site of degeneration in the disease, suggesting that disruption of NPC1-mediated vesicular trafficking in astrocytes may be linked to neuronal degeneration . It is interesting that selective restoration of expression of Npc1 in GFAP-positive astrocytes in Npc1−/− mice enhanced survival and decreased neuronal storage of cholesterol in the CNS, while restoration of expression of Npc1 in GFAP-positive in enteric glial cells in Npc1−/− mice ameliorated enteric neuropathology [110, 265]. Aceruloplasminemia is an inherited disorder of iron metabolism caused by the lack of ceruloplasmin activity. The neuropathological hallmarks are excessive iron deposition, neuronal loss, bizarrely deformed astrocytes, and numerous ‘grumose’ or foamy spheroid bodies. In the CNS, ceruloplasmin is largely produced by perivascular astrocytes and exhibits a ferroxidase activity that inhibits iron-associated lipid peroxidation and hydroxyl radical formation . Astrocytes play key roles in iron trafficking and the detoxification of iron-mediated free radicals. Lack of ceruloplasmin causes direct oxidative stress on astrocytes. In aceruloplasminemia, deformed astrocytes accumulate ferric iron and the antioxidative ability of astrocytes is compromised, leading to secondary neuronal cell death . Astrocyte abnormalities and CNS malformations or lesions are also associated with the rare genetic disorders, congenital glutamine synthetase deficiency , and pyruvate carboxylase deficiency . Alexander disease is a genetic disorder of astrocytes caused by a dominant, gain-of-function mutation of the gene encoding GFAP . Astrocytes are hypertrophied and exhibit numerous, characteristic Rosenthal fibers that are aggregates of GFAP and are therefore prominently GFAP-immunoreactive [25, 247]. There is particular involvement of the white matter and patients exhibit macrocephaly, seizures, psychomotor disturbances, spasticity, and premature death. Over expression of GFAP in transgenic mice causes a fatal encephalopathy similar to the human condition . It is interesting to note that high densities of Rosenthal fibers, comparable to those seen in Alexander’s disease, have been described in the context of pronounced astrocytic abnormalities in severe FCD with intractable pediatric epilepsy (Fig. 6b)  (see above). Megaloencephalic leukoencephalopathy with subcortical cysts (MLC) is an autosomal recessive, progressive white matter disease in children, characterized by myelin splitting and intramyelinic vacuole formation and caused by mutations in the MLC1 gene. In the CNS, the MLC1 protein is specifically expressed in distal astroglial processes in perivascular, subependymal, and subpial regions. This localization plus the transmembrane domains of the protein, support the possible transport functions of MLC1, possibly across the blood–brain and brain-cerebrospinal fluid barriers [21, 210]. Vanishing white matter disease (VWM) is a rare autosomal recessive leukoencephalopathy linked to mutations in translation initiation factor 2B (eIF2B). 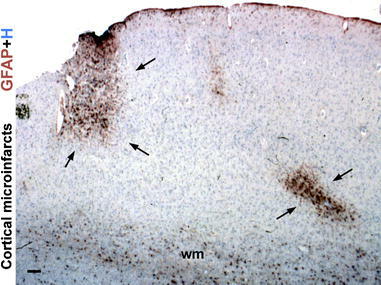 VWM lesions in vivo lack GFAP expressing astrocytes. Mutations in the eIF2B genes are thought to impair the ability of cells to regulate protein synthesis. RNAi targeting of EIF2B5 severely compromised the generation of GFAP expressing astrocytes from normal human glial progenitors, raising the possibility that a deficiency in astrocyte function may contribute to the loss of white matter in VWM [55, 244]. Glaucoma is characterized by unexplained loss of retinal ganglion neurons and by the reactive gliosis of astrocytes and related Müller cells in the retina, and the reactivity of astrocytes that surround ganglion cell axons in the optic nerve head. It is not clear whether the reactive gliosis in the retina is merely a response to a process afflicting the ganglion neurons or whether the gliosis contributes to that degeneration by loss of glial supportive functions, such as glutamate uptake, or contribution of degenerative effects such as production of reactive oxygen species [26, 109]. The optic nerve head, where the optic nerve emerges from the eye, is an area where several tissues meet and the area may be under particular stress and flux during increases in intraocular pressure as are often associated with glaucoma. Astrocytes in the optic nerve head differ from white and gray matter astrocytes and have a distinct appearance and morphology. In rodents, optic nerve astrocytes are spatially aligned to ensheathe axons in bundles in a unique arrangement that provides essential structural support for the axons . In primates, optic head astrocytes exhibit a similarly specialized morphology and provide additional structural support by secreting an extracellular matrix referred to as the lamina cribrosa [94, 262]. Various lines of evidence suggest that an early precipitating event in glaucoma may be disturbances of axon–astrocyte interactions at the optic nerve head (perhaps as a consequence of increased stresses caused by raised intraocular pressure), which in turn lead to axonal damage and subsequent retrograde degeneration of retinal ganglion neurons [94, 98, 262]. Compelling evidence now indicates that pain signaling in the spinal cord dorsal horn involves interactions among microglia, astrocytes and neurons . As discussed earlier, astrocytes can influence synaptic activity in a variety of direct and indirect ways and astrocytes participate in regulation of CNS inflammation by responding to and producing a wide variety of cytokines. These mechanisms provide the basis for astrocyte involvement in both normal and pathological pain signaling. There is a growing body of evidence that astrocytes, which are chronically reactive in the dorsal horn due to local cellular interactions, have the potential to contribute to and exacerbate chronic and neuropathological pain in various ways, including release of neurotransmitters and neuromodulators such as glutamate, NO and PGE or through release of cytokines like TNFα that alter neuronal membrane receptor levels, all of which can amplify neuronal excitability . The molecules involved in these emerging multi-cellular signaling interactions are providing novel targets for analgesic therapeutic strategies. Prolonged cortical spreading depression is thought to play a fundamental role in the pathophysiology of migraine and can be caused by excessive synaptic glutamate release, or by decreased removal of glutamate and potassium from the synaptic cleft . Familial hemiplegic migraine type 2, an autosomal dominant form of migraine with aura, has been associated with four distinct mutations in the alpha2-subunit of the Na+,K+-ATPase that is expressed primarily in astrocytes. The mutations all result in decreased activity of the Na+,K+-pump in astrocytes , which in turn may lower the threshold for cortical spreading depression and migraine attacks. Reactive astrogliosis is a well-known feature of Alzheimer’s disease (AD), but its roles in AD are not well understood. Reactive astrogliosis tends to be focal in AD such that reactive astrocytes are intimately associated with amyloid plaques or diffuse deposits of amyloid and surround them with dense layers of processes as if forming miniature scars around them (Fig. 7a), perhaps to wall them off and act as neuroprotective barriers. Reactive astrocytes can contain substantial amounts of different forms of amyloid beta, including amyloid beta 1–42 (Aβ42) as well as truncated forms [159, 239]. Of considerable interest are reports that reactive astrocytes can take up and degrade extracellular deposits of Aβ42  and that this function is attenuated in ApoE−/− astrocytes , suggesting that reactive astrocytes functions or dysfunctions could play a role in the progression and severity of AD. The intensity of reactive astrogliosis, as determined by GFAP levels, has been reported to increase in parallel with increasing progression of Braak stages in AD, while concomitantly the levels of astrocyte glutamate transporters have been reported to decline, which may raise the vulnerability of local neurons to excitotoxicity . Reactive astrocytes also exhibit increased expression of presenilin in sporadic AD [101, 254], but the consequences of this expression are not known. Astrogliosis is prominent, diffuse, and intense throughout affected CNS regions in transmissible spongiform encephalopathies such as Creutzfeldt–Jakob disease (CJD) (Fig. 7b) and related prion diseases, especially if clinical symptoms have been of long duration. Although this astrogliosis exhibits some characteristics of severe diffuse reactive astrogliosis (Figs. 3c, 4c), it is not clear whether astrocytes play an active role in prion replication and disease pathogenesis or whether astrogliosis is largely reactive to the disease process in other cell types . It is interesting that the hippocampal neuronal degeneration associated with experimental ablation of reactive astrocytes has a vacuolar appearance with similarities to spongiform changes . The role of astrocytes in Parkinson’s disease and related syndromes is sparsely investigated and poorly understood . 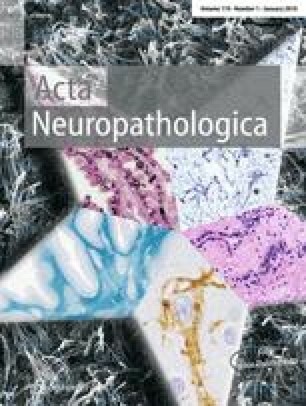 Reactive astrogliosis is generally mild or moderate and rarely severe in autopsy specimens of substantia nigra from Parkinson’s disease patients [72, 149]. Astrocytes have been implicated as potentially exerting both neurotoxic and neuroprotective activities in Parkinson’s disease. Experimental studies show that astrocytes take up the Parkinson’s syndrome causing molecule, MPTP, from the blood stream and convert it to neurotoxic MPP+ and may similarly convert other environmental molecules that have been implicated in dopaminergic toxicity [54, 187]. On the other hand, activation of the transcription factor Nrf2 selectively in astrocytes protects mice from MPTP-induced Parkinsonism by activating anti-oxidative response pathways . Rare mutations in Nurr1 lead to familial Parkinson’s disease, and expression of Nurr1 in astrocytes suppresses production of potentially toxic molecules and protects against loss of dopaminergic neurons . Recent findings also show that subpopulations of astrocytes express disease-related proteins such as α-synuclein, parkin and phosho-tau to different levels and in different combinations in Parkinson’s disease, multiple-system atrophy, and progressive supranuclear palsy , but the roles of astrocytes in these conditions are not yet defined. Evidence is available suggesting two quite different potential roles for astrocytes in amyotrophic lateral sclerosis (ALS) or motor neuron disease, through either the loss of a neuroprotective function or the gain of a neurotoxic effect. Sporadic ALS is characterized by selective loss or dysfunction of astrocyte glutamate transporters in spinal cord and cerebral cortical areas that exhibit loss of lower and upper motor neurons [73, 136, 194, 197], suggesting that increased glutamate excitotoxicity may contribute to motor neuron death and raising the possibility of different types of potential interventions. A high-throughput screen of small molecules has identified that certain β-lactam antibiotics can stimulate the expression of glutamate transporters by astrocyte and thereby enhance glutamate uptake sufficiently to reduce excitotoxicity, and provide neuroprotection in animal models of stroke and ALS . The β-lactam antibiotic, Ceftriaxone, began stage 3 clinical trials in May 2009 to determine efficacy in reducing excitotoxicity and neurodegeneration in ALS. Focal grafts of healthy astrocytes are reported to be neuroprotective in an animal model of ALS, suggesting that transplantation of astrocytes may be a potential therapeutic strategy . From a different perspective, astrocytes may also exhibit neurotoxic dysfunction in ALS. Approximately 20% of familial ALS cases, and about 5% of apparently sporadic cases, exhibit missense mutations of the gene encoding superoxide dismutase (SOD) that are dominantly inherited . Recent findings show that expression of ALS mutant SOD in astrocytes (but not other cell types) leads to production by astrocytes of soluble molecules that are selectively toxic to motor neurons but not to spinal cord interneurons [53, 158], but the nature of the toxic molecules and the mechanisms leading to their production are not yet clear. Tauopathies are primarily associated with intracellular filamentous deposits in neurons that lead to functional disturbances . Nevertheless, there is evidence to suggest that astrocyte tau pathology may also contribute to disease mechanisms. Filamentous tau aggregates can be observed in astrocytes in human disease and in animal models, and in animal models can disturb glutamate uptake and other astrocyte functions leading to focal neuronal degeneration [48, 71]. In Huntington’s disease, excitotoxicity has long been regarded as contributing to neuronal loss but the underlying mechanisms have been difficult to elucidate . There is increasing investigation of the potential for astrocytes contributions to dysfunction and degeneration in Huntington’s disease through disturbances in glutamate uptake that can alter synaptic function and lead to excitotoxicity, or through abnormal production of neurotoxic molecules [127, 136]. As it becomes increasingly clear that astrocytes play essential roles in synaptic mechanisms (see above), there is growing evidence that astrocyte functions and dysfunctions may contribute to behavioral mechanisms and behavioral disorders . For example, studies in experimental animals show that disruption of astrocyte-specific Na+,K+-ATPase results in increased anxiety-related behavior and impaired spatial learning in mice , and that astrocyte influences on synaptic functions are important in reward circuits, and may contribute to drug addiction . Clinicopathological studies show that expression of astrocyte glutamate transporters has been found in prefrontal cortex of schizophrenic patients , and that the density of astrocytes is reduced in prefrontal cortex of patients with major depressive disorders [146, 189, 218]. Layer-specific reductions in GFAP-reactive have also been reported in astrocytes of the dorsolateral prefrontal cortex in schizophrenia  and astrocyte roles in synaptic function are now central to certain hypotheses regarding schizophrenic disease mechanisms [19, 151]. The study of cellular neuropathology in psychiatric disorders is fraught with roadblocks. Morphologic abnormalities associated with behavioral illness may be extremely subtle and difficult to detect. Individuals tend to die with a psychiatric disorder rather than of it (the exception to this being death by suicide), so that at the time of necropsy a past history of psychiatric illness may not be noted, or there may be changes in the brain secondary to longstanding other medical problems that ‘mask’ any intrinsic structural changes underlying a psychiatric illness. After many years of neuropsychiatric problems in a given patient, it may be difficult or impossible to distinguish structural sequelae of pharmacotherapy from structural changes that caused the illness. Astrocyte contributions to behavioral disorders are only beginning to be explored. In this regard, it should be considered that astrocytes may not show overt structural changes or changes in commonly used astrocyte markers in necropsy specimens. As histopathological molecular identification techniques expand in breadth and become more sensitive, it may become possible (keeping in mind the caveats just mentioned) to detect astrocyte specific changes in molecular expression that are associated with specific disorders and clinical conditions. Astrocytes play a major role in the evolution of many common primary brain tumors, gliomas, and a less prominent, though significant, role in the progression of metastases. From a practical diagnostic viewpoint, GFAP is a reliable immunohistochemical marker for staining surgically resected brain neoplasms to ascertain whether they have a significant component of cells differentiating along astrocytic pathways . The likelihood that a neoplasm is an ‘astrocytoma’ increases if cells throughout the tumor manifest atypical nuclear features (which can vary considerably in their degree of atypia) and also show some degree of cytoplasmic immunoreactivity with GFAP (Fig. 8a, b). Alternatively, abundant reactive astrocytes may show GFAP immunoreactivity within or surrounding non-glial tumors such as primary CNS lymphoma (Fig. 9a) or medulloblastoma (Fig. 9b) . When GFAP-positive reactive astrocytes align themselves in a scar-like fashion along a non-glial (usually metastatic) tumor, the impression of a secondary neoplasm is strongly supported. Malignant astrocytic glioma, such as glioblastoma (astrocytoma WHO grade IV), are the most common and among the most lethal intracranial tumors [76, 128]. The cells of origin of astrocytic gliomas, whether potentially astrocytes, glial precursors, or stem cells, are the subject of intense investigation . In a manner consistent with the cancer stem cell hypothesis, there is considerable evidence that only minor populations of cells in primary gliomas are capable of forming a tumor, [76, 223]. 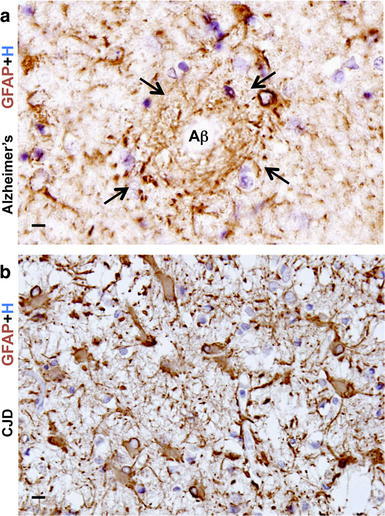 The presence throughout adult brain of periventricular adult NSC that express the astrocyte marker GFAP (see above), raises interesting questions regarding the possible contribution of these cells to astrocytoma initiation. Astrocytic gliomas contain small numbers of cells that exhibit stem cell-like properties in that they self-renew, are multipotent and form neurospheres in vitro and constitutively produce the different types of cells found within the parent tumors . Growth properties of glioma-derived neurospheres in vitro were found to be significant predictors of tumor progression in vivo and of clinical outcome . Nevertheless, the origins of glioma are not yet understood and could be heterogeneous. Astrocytic gliomas exhibit molecular heterogeneity, particularly as regards expression patterns of transcriptional regulators, tumor-suppressor proteins and kinase mutations, and molecular phenotyping of glioma is opening up the potential for molecularly targeted therapies . Some properties of astroglioma appear related to astrocyte functions. For example, glutamate production by glioma may increase invasive growth properties . Enhanced STAT3 signaling activity by astroglioma reduces inflammation and tumor-immune surveillance and increases cell proliferation  in a manner consistent with functions of STAT3 signaling in astrocytes . Neurofibromatosis type 1 (NF1) is an inherited neurocutaneous disorder with neuropsychologic deficits and predisposition to Schwannomas and astrocytomas caused by mutations in the NF1 gene [2, 9]. Reduced expression of glutamate transporters have been reported in reactive astrocyte clusters in NF1 . Changes in mTOR and PTEN-signaling pathways in Schwann cells and astrocytes may contribute to tumorigenesis in NF1 [50, 87]. The gastrointestinal tract is highly innervated and neuropathology of the enteric nervous system is emerging as a central feature of many gut diseases. Although most considerations of the enteric nervous system have focused on neuronal dysfunction, a large population of astrocyte-like glia populates gut muscle layers and the intestinal mucosa, and mounting new evidence points toward enteric glia, which express GFAP and share functional similarities with astrocytes, as active participants in gut pathology . Various lines of experimental and neuropathological evidence are consistent with the possibility that enteric glia constitute a previously unrecognized disease target in pathologies associated with intestinal barrier dysfunction, notably inflammatory bowel disease, necrotizing enterocolitis, irritable bowel syndrome, diabetes, autoimmune disease, and neurotropic virus infection of the gut pathology [44, 207]. Experimental ablation of enteric glia leads to inflammatory bowel disease . Both astrocytes and related enteric glial cells are able to induce barrier properties in gut epithelial cells, and S-nitrosoglutathione (GSNO) has been identified as one molecular mediator of this effect . Thus, enteric glia, like astrocytes, appear to play essential roles in barrier functions during disease processes, particularly as regards regulating the spread of inflammation [49, 207, 226, 251]. There is now growing evidence that stellate shaped, GFAP-expressing cells in various tissues may have functions that are similar to those of astrocytes. For example, there is increasing evidence that GFAP-expressing pancreatic stellate cells play important roles in tissue repair, fibrosis, and scar formation . Hepatic stellate cells not only express GFAP and have morphological appearance similar to astrocytes, but also contact hepatic sinusoids and blood vessels and may take part in hepatic immune processes [258, 259]. In this regard, it is particularly interesting that the liver, like the CNS, has a certain level of immune privilege , and that both CNS and liver have resident populations of macrophage-related cells (Kupfer cells in the liver and microglia in the CNS) as well as of stellate cells that participate in immune and inflammatory processes. In addition, there is evidence that GFAP-expressing mesangial cells in the kidney function as local modulators of innate and adaptive immune responses . The increasing recognition that tissue-specific cells like astrocytes and stellate cells play essential roles in regulating local immune and inflammatory processes is likely to impact considerably on concepts about organ-specific vulnerability to autoimmunity and other inflammatory conditions. The actively ongoing dissection of molecular mechanisms of reactive astrogliosis is beginning to identify molecules whose functions might be enhanced or blocked in specific disease contexts as potential therapeutic strategies [66, 226]. For example, augmenting the function of the astrocyte glutamate transporter EAAT2 with parawexin 1, a molecule isolated from spider venom, protects retinal neurons from ischemic degeneration by enhancing glutamate uptake and reducing excitotoxicity . Certain β-lactam antibiotics, identified by a high-throughput screen of small molecules, can stimulate the expression of astrocyte glutamate transporters sufficiently to reduce excitotoxicity and neuroprotection in models of stroke and ALS . Transplantation strategies involving astrocytes are also under investigation. For example, grafts of stem or progenitor cells that mature into healthy astrocytes cells are reported to improve outcome in a mouse model of ALS in which host astrocytes are abnormal and express a mutant SOD . A different strategy employs grafts of astrocytes that are genetically modified to produce specific molecules, such as growth factors, as therapeutic pumps to deliver those molecules in specific locations [18, 233]. In due course, grafted astrocytes may be tested in clinical contexts and become subject to neuropathological evaluations. Work in the authors’ laboratories is supported by grants from NIH, RO1 NS057624 (MVS), P50 AG16570 (HVV) and P01 AG12435 (HVV), the Roman Reed Spinal Cord Injury Research Fund (MVS) and Wings for Life (MVS) and the Daljit S. and Elaine Sarkaria Chair in Diagnostic Medicine (HVV). Nicole Yin and Spencer Tung assisted with preparation of illustrations.